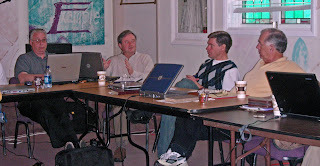 The Fellowship Council, the board of directors for the Fellowship of Grace Brethren Churches, is meeting this week in Seal Beach, Calif. Much of their discussion has centered around the Commitment to Common Mission, a document that resulted from the Charis international leadership meetings last summer in Germany. Today, they listened to reports from the various national ministries. At right, Dr. Larry N. Chamberlain, president and CEO of the Grace Brethren Investment Foundation, talks about the Eagle Commission, of which the GBIF is the sponsoring organization. The Eagle Commission serves as a strategic link between the people and churches of the FGBC and Grace Brethren military chaplains. Pictured left to right are Greg Howell, pastor of Community Grace Brethren Church, Goldendale, Wash.; Dr. Chamberlain; Jim Brown, pastor of Grace Community Church, a Grace Brethren church in Goshen, Ind., and past moderator of the FGBC; and John McIntosh, senior pastor of the Grace Brethren Church of Simi Valley, Calif., and current moderator of the Fellowship. Also reporting were Ed Lewis, CE National; Ken Seyfert, Grace Brethren Investment Foundation and the FGBC retirement plan; Dr. Ron Manaham, Grace College and Theological Seminary; Dr. Tim Boal, Go2 Church Planting Ministries; Janet Minnix, Women of Grace USA; and Liz Cutler Gates, Brethren Missionary Herald Company. The Council also approved recommending to the national conference the addition of two new churches into the Fellowship. Soma Community Church (David Black, pastor) is located in Springfield, Ohio, and ClearView Church (Andy Wirt, pastor) is in New Albany, Ohio. Three cooperating ministries were also recommended for adoption: GBCanada USA, an organization to support church planting in Canada; Integrated Community Development Inc. (ICDI), an organization that works in central Africa to develop leadership and empower communities to overcome difficult problems on their own; and Grace in Action, an organization that helps bridge the church to the community through education and economic development. These recommendations will be considered at the annual meeting of the Fellowship in July in Columbus, Ohio. The Council meetings, which are being held at Grace Community Church, a Grace Brethren church in Seal Beach, Calif., end tomorrow (Saturday).